This morning (Friday 23rd June, 2017) at the TIFF Bell Lightbox, film critics were treated to a delicious breakfast and presentation preview of Disney Pixar’s latest animated feature COCO to open coming November. Coco is a 3D computer-animated fantasy adventure film based on an original idea by Lee Unkrich. The film is directed by Unkrich, and co-directed and written by Adrian Molina. The plot involves a 12-year old Miguel (voiced by newcomer Anthony Gonzalez) whose family has banned music as his great, great grandfather had left his family to become a great musician. Despite his family’s generation-old ban on music, Miguel dreams of becoming an accomplished musician like his idol Ernesto de la Cruz. Desperate to prove his talent, Miguel finds himself in the Land of the Dead. The Festival of the Dead is celebrated in Mexico for the time when the dead crosses the border to be with the living. Along the way, he meets charming trickster Hector (Gael Garcia Bernal) and together they set off on an extraordinary journey to unlock the real story behind Miguel’s family history. The presentation was supposed to be presented by the film’s two directors and Academy Award-winning producer Darla K. Anderson. But Lee Unkrich had to stay behind to finish the film, so co-director Molina and Anderson were left, but they did deliver an awesome presentation. The presentation began by showing the first 10 minutes of COCO’s opening, where the history of his family and the ban of music originated. The last part of the piece is still not coloured and shown in storyboard form. But one cannot mistake the magic of Disney, present throughout the 10 minutes. The finished product will undoubtedly be something unforgettable. Other clips include Coco at the singing competition and another with Coco and his pal, Hector in the Land of the Dead. The common thread in all of these is the magnificent colour palette that makes COCO standout among other Pixar features. Besides clips from the film, there is a clip that showed Disney staff surprising Anthony Gonzalez that he got the part for voicing Miguel. This clip shows the family atmosphere of Disney that makes the Studio great. Co-director Molina’s mother is Mexican, so he bring a lot of his own heritage into the film. A troupe of COCO’s filmmakers also travelled and stayed in Mexico for a time, according to what was said during he presentation. The presentation concluded with a Question and Answer section with the critics – nothing to write home about, since us critics are not the most imaginative people alive, questions or what not. COCO opens in November and is certainly going to be an event to watch out for. 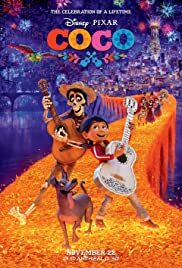 Do click on the link below to watch the trailer for COCO.